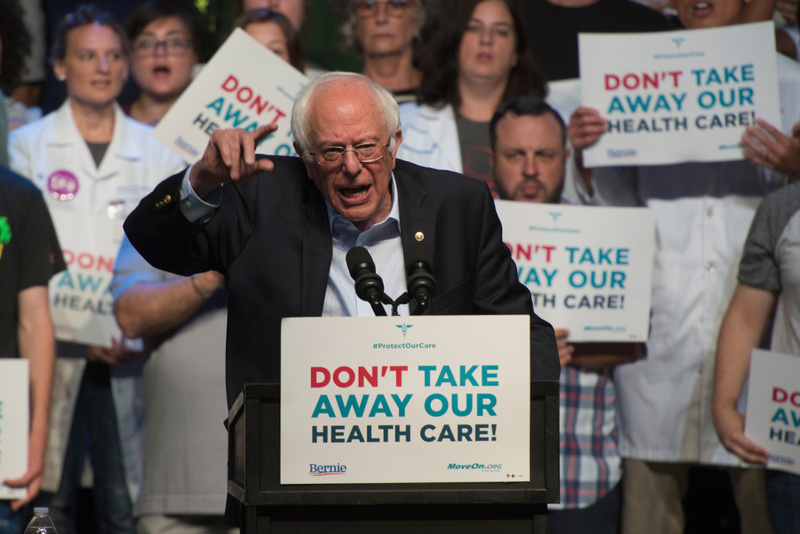 Bernie Sanders speaks during a Stop Trumpcare emergency rally with MoveOn.org at Express Live on June 25, 2017 in Columbus, Ohio. Sen. Bernie Sanders will publicly unveil a new version of his single-payer healthcare bill today. Among his ticket of early supporters and 15 co-sponsors include Senators Elizabeth Warren (D-Mass. ), Kamala Harris (D-Calif.), Cory Booker (D-New Jersey) and Tom Udall (D-New Mexico). Following a House bill allowing Medicare for all, the bill will eventually die in a GOP Congress. But aside from political debate, what does universal health care need to succeed in America? AirTalk dives into a full hour of analysis with economists and policy experts. Tevi Troy, CEO of the American Health Policy Institute and author of the book, "Shall We Wake the President? Two Centuries of Disaster Management from the Oval Office"